Adding drapery trim and banding is an easy and affordable way to enhance your custom window treatments. While the styles of decorative trim and banding have certainly changed over the years, these upgrades are still as popular as ever. Adding decorative trim or coordinating fabrics is an easy way to add character to your custom window treatments. Use drapery trim to create an element of visual interest, add a pop of color, or hide seams on the face of your draperies. At flair21, we offer multiple styles of drapery trim to give you total control over the appearance of your custom window treatments. 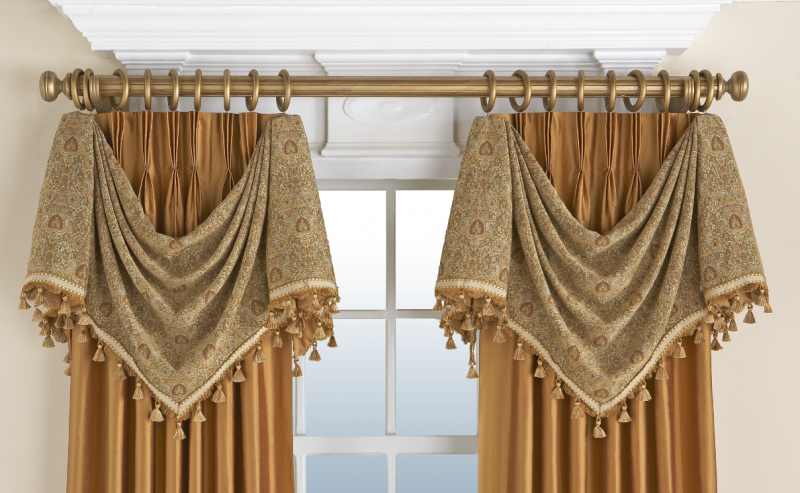 Try adding this upgrade to your next drapery, ripplefold, or Roman shades project. 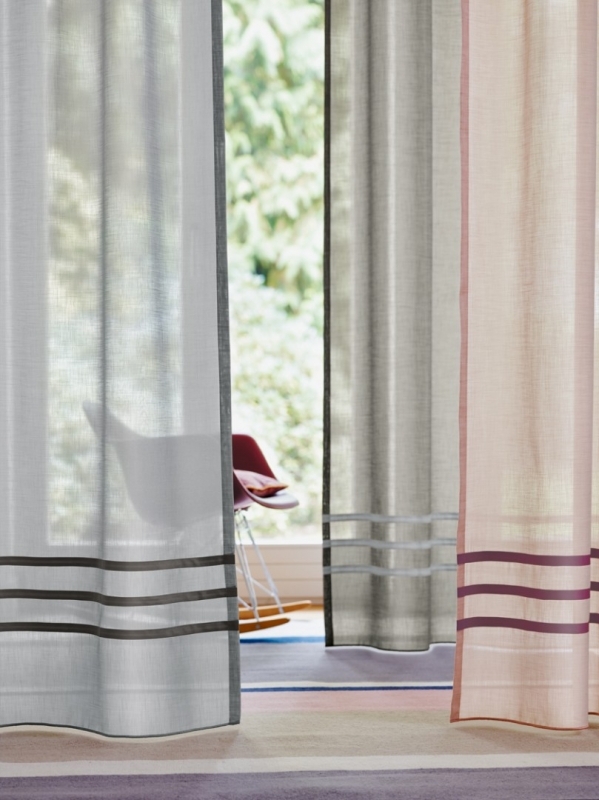 When using solid color fabrics such as linen and silk, adding ribbon banding is an inexpensive and easy way to upgrade the appearance of your drapes. Use our satin or biased matte banding to add a pinch of color to many of our solid fabrics. If you’re new to working with drapery trim and banding, start by adding a decorative border along the leading edge of some pinch pleated draperies. This simple upgrade is an excellent way to add a pop of color to your finished window treatments. Ribbon banding also works well to dress up stationary side panels. Another popular option is to use multiple bands to create a decorative border at the top or bottom (or both!) of your draperies. Subtle curves and clean lines make this a great addition to any ripplefold panels. 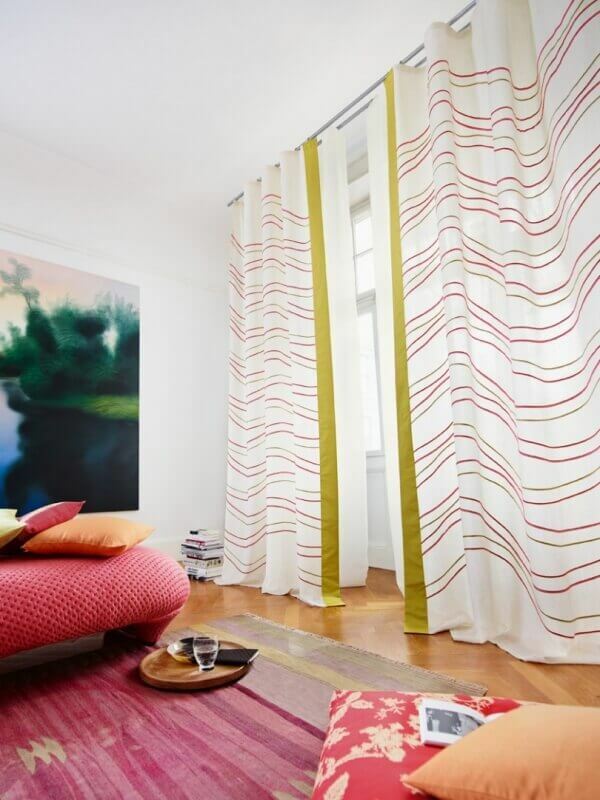 On your next project, try placing three horizontal bands across the bottom of your drapery. This is also an excellent way to hide any horizontal seams on the face of your fabric. On Roman shades, adding an inset border in a contrasting color is also a popular option. Consider adding banding on both the sides and bottom of your shades to frame out each window treatment. Try placing a Greek Key design in the corners for even more visual interest. When it comes to ribbon banding, we offer over 65 colors to choose from. Select from our satin or matte biased styles. Samples of each style and color are available on a convenient sell sheet. Contact our Business Development Office to get your hands on a copy. For a bolder statement, consider pairing multiple fabrics on the same treatment. With over 1,000 colors, textures, and styles to choose from, we offer limitless combinations of coordinating fabrics. To begin, try pairing sheer and drapery weight fabrics (see photo above). Add a solid colored band across the bottom, middle, or top of each drapery. In rooms with very tall ceilings (taller than 10′), it can be difficult to find wide-width, railroaded fabrics that are tall enough to work in a particular space. By banding a coordinating fabric to the bottom of the drapery panel, you can extend the height of the draperies without introducing any vertical seams. Ribbon or drapery trim can be added to cover any horizontal seams that do appear. Adding a flange can also increase the overall height of your finished window treatments. Decorative folds on the face of your fabric can hide unsightly horizontal seams. For a more traditional look, try adding tassels, fringe, or patterned banding to your drapery order. This is perfect for customers who want more formal window treatments or for those who prefer a traditional aesthetic. Try adding tassel fringe along the edges of decorative swags (pictured with pleated panels) and other top treatments. We offer many different styles of decorative fringe, banding, and tiebacks in 12 different colors. All in-stock trim and banding is 50-percent off while supplies last! Contact us for more information or to place your order. If you’re looking for something a little more unique, we can accept decorative trim from other vendors. Simply send us a sample piece for approval before you place your order.